After the enormous success of 1978’s ultra-cheap Halloween, director John Carpenter enjoyed much greater financial freedom for his next flick. Carpenter decided to return to the well to a degree, as 1980’s The Fog provided another exercise in horror. However, to the director’s credit, he didn’t simply revisit the same slasher territory. Instead, The Fog involves thrills of a spookier, ghostly design. While not a classic like Halloween, The Fog has its moments and offers a generally effective piece. A town along the California coast, Antonio Bay rapidly approaches its 100th anniversary. The citizens plan a major gala to commemorate this date, but it turns out that something dark comes along with the centennial. Apparently Antonio Bay was founded under sinister circumstances, and the ghosts of the victims have come back to seek their revenge under cover of the fog. And there’s your story! The Fog offers a simple plot, as it provides nothing more than a basic ghost story. The deceased attempt to satisfy their urges, and the living try to stop them. In the latter category, we meet a few specific residents of Antonio Bay. Stevie Wayne (Adrienne Barbeau) lives with her young son Andy (Ty Mitchell) and runs KAB, the local radio station. Its only DJ, she operates it from a lighthouse, and that gives her the best vantage point for the progress of the fog. A few other characters round out the main set. Trucker Nick Castle (Tom Atkins) picks up hitchhiker Elizabeth Solley (Jamie Lee Curtis), bangs her, and they spend the rest of the film together as they try to avoid death. Kathy Williams (Janet Leigh) organized the centenary celebration, while Father Malone (Hal Holbrook) is the only one with any knowledge of the menace; a descendant of a town founder, he possesses the key to stop the threat. The Fog entails little thought and action; instead it opts for lots of running and screaming. Not that this means it offers a brainless affair. Actually, Carpenter explores the story at a nicely leisurely pace. From very early in the film, we become aware of the nastiness inside the fog, but only as the flick progresses to we slowly pick up on the origins of the terror. Many directors would have tossed out all the exposition at once, but the gradual unveiling of the facts works well. This allows the scariness to escalate and unfold naturally. 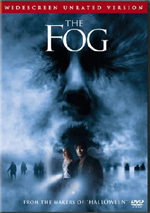 The Fog doesn’t pile on horror, and it probably seems tame to fans weaned on graphic flicks. As we learn in the disc’s supplements, the original cut of the movie included even fewer of those sorts of moments; Carpenter had to conduct reshoots to goose up the fear factor. In any case, I like the less concrete nature of the chills. The film works due to its atmosphere and doesn’t rely so much on obvious tactics. I don’t think The Fog did very well at the box office when it first appeared, and the vague nature of the villain may have caused some of that coolness. After all, the concept of an evil meteorological pattern seems silly. Nonetheless, The Fog works pretty well. It attempts to offer a somewhat old-fashioned ghost story, and it usually succeeds. Though often predictable, the flick’s creepy and tense ambience makes it reasonably compelling. The Fog appears in an aspect ratio of approximately 2.35:1 on this Blu-ray Disc. This was a good but not exceptional presentation. Though I speculate that some of the “problems” stemmed from the source photography. My biggest concern here came from softness, as more than a handful of shots looked rather fuzzy. Given the movie’s nature, that made some sense, though I thought the softness appeared in less than logical scenes at times. It’d be one thing if the fog-related shots were the ill-defined ones, but softness popped up in places that didn’t appear particularly logical. In any case, overall definition was good, so I didn’t mind the occasional soft shot too much. Jagged edges and shimmering created no concerns, and edge haloes remained absent. I witnessed no signs of digital noise reduction, and the movie lacked notable print flaws; I might’ve detected a speck or two but that was about it. Due to the subject matter, The Fog presented a fairly subdued palette, which the disc reproduced neatly. Colors looked accurate and adequately saturated within those parameters. Black levels appeared deep and rich, while shadow detail was clean and appropriately thick. The occasional softness made this a “B”, but the image generally satisfied. I also liked the DTS-HD MA 5.1 soundtrack of The Fog. Remixed from the original monaural, the audio remained anchored in the front much of the time, but the new track expanded the horizons well. It presented a good sense of general atmosphere and presence, though much of the track remained rather monaural. Music showed modest stereo spread at times, while effects tended to emphasize general ambience. I heard some minor panning and movement, and also a few localized elements, but the track didn’t try to expand terribly far beyond its original parameters. The surrounds provided some basic reinforcement but not much else. Audio quality seemed dated but decent. Speech came across as reasonably distinct and accurate. Some flatness interfered at times, but usually dialogue sounded fine, and I heard no problems related to edginess or intelligibility. Effects appeared somewhat tinny and harsh at times, and the track seemed to accentuate treble too much. However, music sounded fairly bright and dynamic, and the score displayed some effective bass response on occasion. This wasn’t a great mix but it held up well for its age. How did this Blu-ray compare to the 2002 DVD? Audio was a bit peppier and clearer, while visuals showed increased clarity and cleanliness. Even with my minor complaints, I thought the Blu-ray demonstrated a step up from the DVD. 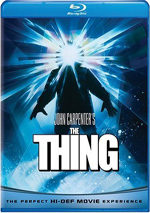 The Blu-ray combines the extras from the old disc with a number of new ones. We locate two audio commentaries, the first of which also appeared on the prior DVD. It comes from director John Carpenter and producer Debra Hill, both of whom were recorded together for this running, screen-specific piece. A veteran of these affairs, Carpenter usually interacts with actors such as Kurt Russell (The Thing and others) and Natasha Henstridge (Ghosts of Mars). Those pairings benefited Carpenter, as the exuberant personalities of the performers complemented his fairly low-key demeanor. Such participants go missed during the track for The Fog. While a reasonably informative piece, it lacks the spark heard during the better Carpenter commentaries. On the positive side, Carpenter and Hill have known each other for years, so they seem comfortable together. Neither dominates the commentary, and both offer a fair amount of nice notes and factoids about the film. Unfortunately, both seem pretty low-key, so the track moves slowly. Both also often tend to simply describe the on-screen action, and they stick with too many technical elements. Carpenter often tells us little more than the locations involved. The commentary remains at least average as a whole, but after the many compelling John Carpenter tracks, this one seems like a disappointment. For the second commentary, we hear from editor/production designer Tommy Lee Wallace and actors Adrienne Barbeau and Tom Atkins. Moderated by Sean Clark of HorrorHound Magazine, all of them sit together for a running, screen-specific look at sets and locations, cast and performances, various effects, music, editing and production design, reshoots, and some other elements. Expect a low-key, moderately enjoyable chat here. Nothing ever goes wrong with it, really, but the commentary also fails to ever become particularly interesting. We get a decent collection of notes that moves at a reasonable pace but fails to do a lot to engage the listener. Next we discover two documentaries from the old disc. Tales From the Mist - Inside The Fog runs 27 minutes, 58 seconds and provides notes from Carpenter, Hill, Wallace, Barbeau, director of photography Dean Cundey, and actor Janet Leigh. Jamie Lee Curtis appears only via material shot in 1980, and we also see a few snippets of Carpenter from that same period. Overall, “Mist” offers a nice recap of the production. 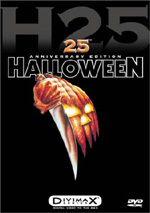 We hear about the aftereffects of Halloween’s success, how Carpenter and Hill came up with the story, casting, production and post-production issues, reshoots and other elements. Carpenter even tosses in a compelling discussion of why he likes to film 2.35:1. The absence of new interviews with Curtis and others feels a little disappointing, but otherwise I find this to offer a very interesting and concise documentary. Less useful is Fear on Film - Inside The Fog, a seven-minute and 42-second featurette from 1980. It includes a few movie clips but mostly consists of “talking head” shots of Carpenter, Hill, Curtis, Barbeau, and Leigh. (These sessions provide the same material seen in the 1980 clips in “Mist”). Essentially a promotional piece, “Fear” gives us a quick overview of the film, its situations, and its characters. While better than most of these sorts of featurettes, it remains bland and superficial. After this we shift to materials not found on the old DVD. My Time With Terror provides a chat with Jamie Lee Curtis. In this 21-minute, 46-second piece, the actor discusses her experiences on Halloween and its impact on her career as well as her work on The Fog, personal relationships that affected the movie, and her horror career after 1980. If you expect a lot of info about The Fog from Curtis, you’ll not get it here. She chats a little about the flick – and shows a refreshing willingness to tell us she doesn’t much like it – but mostly discusses other areas. That’s fine with me, as Curtis offers a lively, blunt presence with a bunch of fun comments. This ends up as a very enjoyable chat. Depressing realization: Curtis is now older than her mother Janet Leigh was when they made The Fog. Cinematographer Dean Cundey becomes the focus of the 18-minute, 40-second Dean of Darkness. He chats about how he got into movies as well as his relationship with Carpenter and Hill, working on The Fog and other films. Though not as entertaining as the Curtis piece – and also not a program that tells us much about The Fog - this one gives us a nice selection of details. Another new featurette, Horror’s Hallowed Grounds examines the movie’s locations. It fills 20 minutes, 22 seconds with info from Sean Clark as he takes us on a tour of various spots used in the film. Much of this proves informative, but Clark tries a little too hard to be wacky at times; for instance, we get a fairly pointless cameo from B-movie actor Robert Rusler. Even with some missteps, “Grounds” provides a cool return to the places used in the flick. In the Outtakes domain, we find a pretty standard gag reel. It includes four minutes, 10 seconds, most of which show the usual goof-ups and giggling. The Storyboard to Film Comparison area lasts one minute, 26 seconds and shows an early scene in which the characters Williams and Wallace get attacked. The storyboards appear on the top and the movie runs on the bottom. Nothing special here, though the drawings seem amusingly crude. A mix of advertising elements appear. We locate three trailers - one theatrical and two teasers - and three TV spots. The Photo Gallery offers a running montage. It lasts eight minutes, two seconds as it provides shots from the film, promotional elements, and behind the scenes images. I like the material but would prefer a standard stillframe collection. Storyboards adds another two minutes, 18 seconds of art, much of which reproduces what we saw in the “Comparison”. Originally presented as an Easter egg, Special Effects Tests gives us two minutes, 39 seconds of fog-creation outtakes. Much of this material already appears in the “Mists” documentary, but it’s still somewhat fun to see. While overshadowed by some of John Carpenter’s better-known creations, The Fog nonetheless provides a reasonably compelling and creepy experience. The movie lacks much of the overt horror audiences might expect, but it creates a nicely eerie atmosphere and succeeds in its own right. The Blu-ray delivers generally good picture and audio as well as a strong roster of bonus materials. I like the film and think the Blu-ray brings it home well.